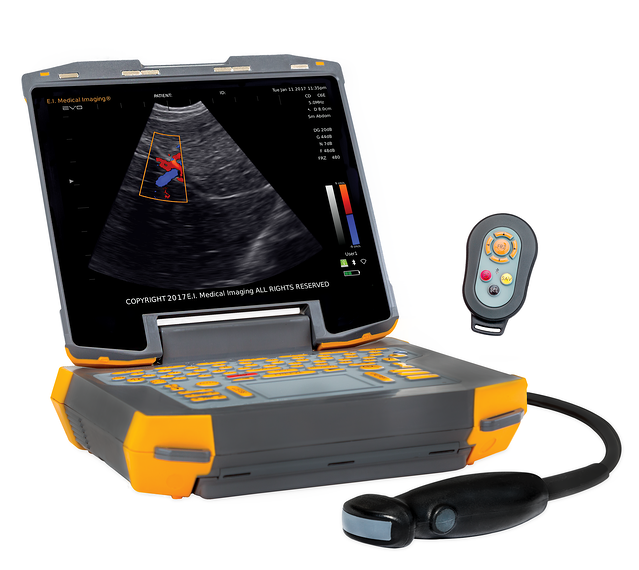 With four times the processing power of previous Ibex® platforms, the Ibex® EVO® II provides image quality never before seen in a portable ultrasound this rugged. Improved image quality will allow the user faster and more accurate exams for any species. At just over six pounds, the Ibex® EVO® II is designed to go anywhere, from an exam table in the clinic to the truck to the barn. With field-swappable batteries you will no longer need to worry about the closest outlet. Engineered with DuraScan® technology, with both sealed keyboards and probe connections, the Ibex® EVO® II can go anywhere your work takes you. EVO® II is the next generation of the latest, most advanced model in the Ibex® family. With significantly better image resolution, color-flow Doppler, remote control, improved features and remote image-viewing apps. EVO® II is ideal for equine practices, companion animal practices, zoos, and anyone demanding a high-quality image in a robust system. Rugged, splash resistant, and highly portable, with a new line of variable frequency transducers, the EVO® II is ready to go wherever you need it most. The EVO® II also accommodates optional video headsets—perfect for viewing in bright sunlight or low light situations. Click here to download our EVO® II brochure. You should be using ultrasound EVERY DAY in your small animal practice! FAST is an acronym for the abbreviated ultrasound examination called Focused Assessment with Sonography for Trauma created as a triage and post-interventional screening test by human trauma surgeons in the 1990s. When used in conjunction with E.I. Medical Imaging’s EVO® II and the new C6E and C9E transducers, FASTVet™ offers something that no other portable ultrasound does—rapid diagnostic protocols on a portable unit and probe designed specifically for small animal veterinarians.